Crunchy cereal bars made with whole grain rolled oats and Canadian maple syrup. Crunchy cereal bars made with whole grain rolled oats and dark chocolate pieces. Crunchy cereal bars made with whole grain rolled oats and honey. 100% wholegrain oats. Lactose free. No colours or preservatives. Suitable for vegetarians. Nature Valley Cereal Bars made with natural wholegrain oats Two delicious Cereal Bars for the perfect on the go snack Why not also try Nature Valley Protein Peanut & Chocolate Cereal Bars or Nature Valley Nut Butter Peanut Biscuits? 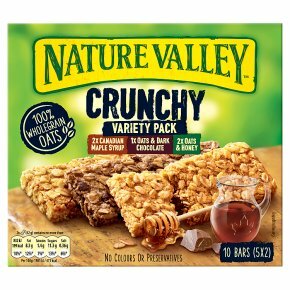 Packed with natural wholegrain oats and other carefully selected ingredients like real honey, indulgent chocolate or Canadian maple syrup, Nature Valley? Crunchy Variety Pack Bars are the perfect on-the-go snacks, which are there for you, whenever you need them most. Nature is bountiful, that's why each of our packs contains two delicious bars, to make the most of your day.